The Yves Saint Laurent masterpiece, now with a more discreet heela style you can rock 24/7 without hurting your feet. 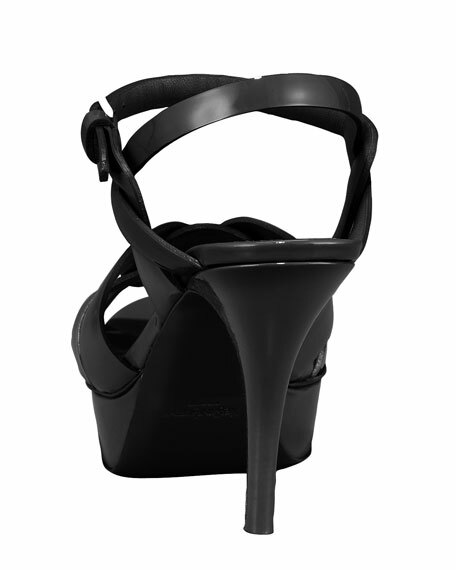 In glossy leather, wide straps loop together over the vamp; T-strap and halter overlap at the sides. Stand securely in ankle strap with adjustable buckle. Sandal rests on 1" platform with beveled front, 4" covered heel. With leather lining and sole. For in-store inquiries, use sku #1978860.